I'm beginning to wonder if Spring is really around the corner....Last Friday we were near 70, this weekend we had constant rain, and are now under a cold spell, with temps dropping to a low of 17 on Thursday. My flowers were just staring to come up....I'm so ready for Spring! 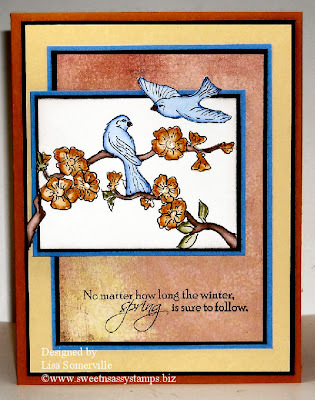 I used the Out of the Box and Marker Watercoloring Technique on the Sparrow/Branch from Sweet 'N Sassy Stamps. To create the Out of the Box, I just eyeballed it and used my paper cutter, this made it much faster! Wow! This is gorgeous. Your coloring is FABulous! Beautiful card! Great job with the techniques. I just love that branch and those birds! So spring-like! Beautiful card Lisa. You really did that image justice.